It’s been a while since we posted anything from Canada, and we don’t want them to feel left out. 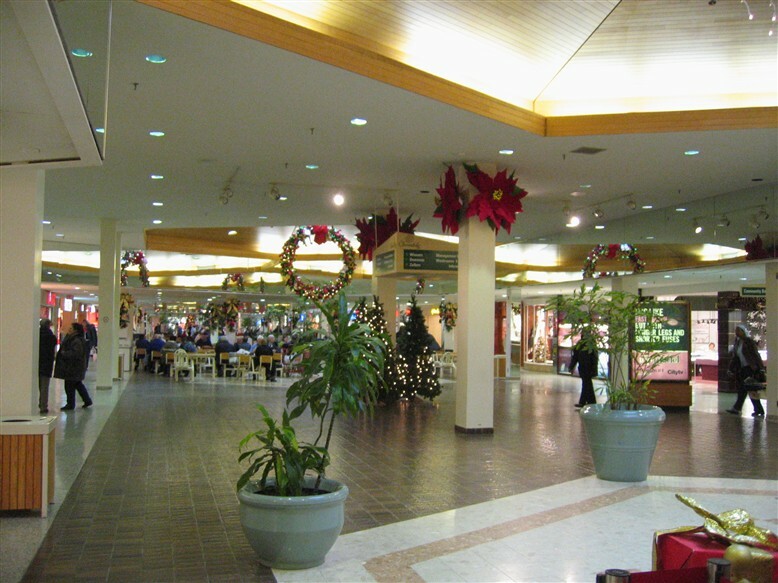 Cloverdale Mall is a 460,000 square foot enclosed mall anchored by Winners, Zellers, and Dominion, a grocery store. 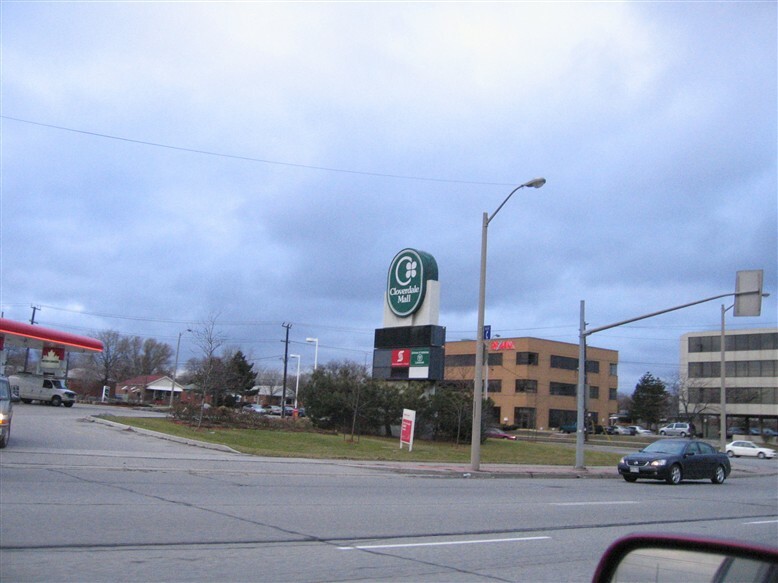 It’s located near the intersection of Dundas St and Highway 427 in the Etobicoke area of west Toronto. There are 105 stores and services in this community-oriented centre, which trends toward service neighborhood-oriented convenience. Perhaps the most interesting thing about Cloverdale Mall is how it exists successfully in the shadow of other malls. Square One Mall in Mississauga, one of the largest malls in North America, is only a few miles away to the west. Sherway Gardens, one of the Toronto area’s largest and most upscale malls, is less than a mile south of Cloverdale. Also, Dixie Outlet Mall, one of Canada’s largest value-oriented malls, is located just two miles away. 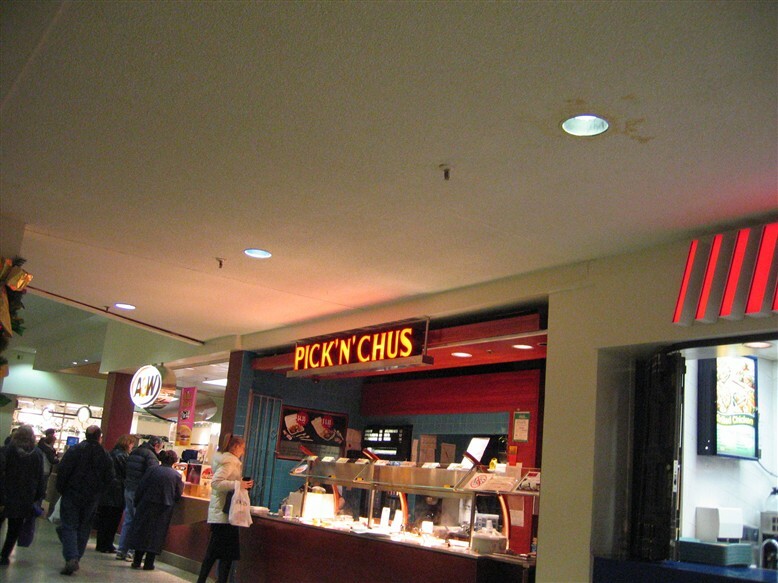 While Square One, Sherway Gardens, and Dixie Outlet Mall draw from a larger area, Cloverdale Mall’s offerings mainly serve the local convenience of those in west Toronto and eastern Mississauga. Cloverdale focuses on service and convenience, whereas the other malls have their niches as well. However, across Dundas from Cloverdale sits a mostly empty, much smaller, and older enclosed center called Honeydale Mall which has suffered greatly in recent years. The decor of Cloverdale Mall is decidedly dated yet well kept, which is also alarming considering the competition immediately surrounding the mall. There are few vacancies, attesting to the fact that the locals use this mall frequently. This represents the main difference between how malls in the U.S. function versus those in Canada. Many neighborhood centers such as this one are not only enclosed but relatively large, and often exist in the shadow of other, larger malls more similar to those in the U.S. 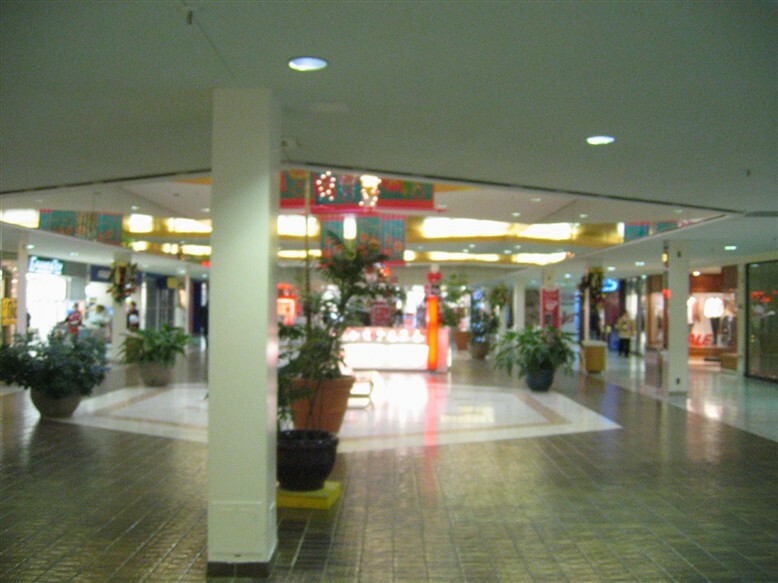 I visited Cloverdale Mall in January 2006 and took the pictures featured below. If you have more information, especially about Cloverdale’s history, feel free to leave some comments. Get Woodside Square and Malvern Town Centre on Labelscar! Wooden-trimmed ceilings? Brown tiled flooring? Reminds me of the Hampshire Mall in Hadley, Mass. This is nothing but conjecture on my part, but to me, the reason why malls like this continue to thrive in Canada is climate. Nobody wants to go from store to store in the middle of January in sub-zero temperatures up here. A mall like this wouldn’t be enclosed in the US. You’d likely have a strip mall anchored by the Zellers and Dominion, Winners would probably be off by itself nearby, and many of the ancillary stores would be in an expanded Sherway Gardens. I totally agree with JP. Crappy weather helps enclosed malls. Seemed like every town in BC has a small mall. Many with grocery stores. Something rarely tried here in the US. If malls weren’t exclusively for “upscale” fashion stores, maybe they’d attract more people. You are missing the real significance of Cloverdale. The floors you see were OUTSIDE streets between two rows of store front canopies supported on Modernist steet poles. It was a real winner when it opened in the early sixties to service the new suburb of Etobicoke. I remember a very classy two floor W.H. Smith’s with an open circular grand staircase. (no longer there if I remember) The Zellers was an original Hudson’s Bay store. This was THE place before Yorkdale opened a few years later. Today it suffers from some bad site planning in the lots and access roads as it was meant to handle 60’s traffic circulation before the mutation of Highway 27 into a 400 series mega-expressway. You are right in that the Honeydale Mall has had a black cloud hanging over it since the day it opened. Somewhere between a strip mall and an enclosed plaza the weblink info is accurate, It reeked of cheap 70’s disco decor and declined after loss of the Walmart. The two malls illlustrate the contrast between 2 owners: one out for a quick return followed by almost semi-abandonment; the other willing to invest heavily in renovation projects like Sherway and Square One. 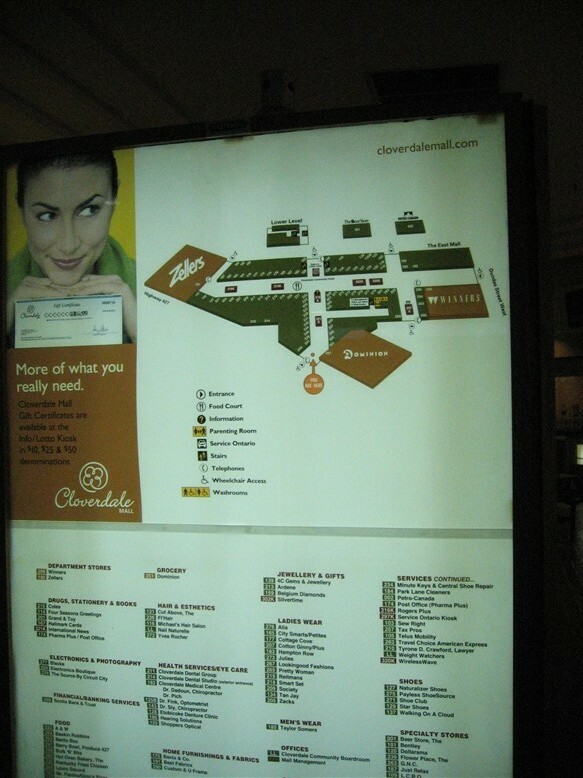 Cloverdale has been successful despite being in the shadow of Sherway Gardens but it is an anomaly and not representative of enclosed malls in Canada – it has an older clientele that is very loyal but they will eventually die off, as will the mall unless it reinvents itself. Cloverdale Mall was built in the mid sixties in the shadow of the many new apartments and townhouses built during that time. I remember visiting it in ’68 and was impressed then. Cloverdale has always had to try hard to keep busy. Some years after Cloverdale Sherway Gardens was constructed and it was the last word at the time. Considered quite upmarket and a new “regional” mall it spelled death to the large old plaza known as Dixie Mall. Dixie Mall had a Sayvettes department store, a Dominion and an Aikenheads Hardware as its anchors. It rapidly fell downmarket when Sayvettes closed and became a flea market. The “discount mall” concept saved the old place. Square One was built to be the new city center and a large regional mall. The advent of Mississauga Transit made it a destination for many. Especially those who lived further west. Square one also meant that smaller malls constructed but 5 years earlier, such as Mississauga Sheridan Mall where demoted to neighborhood malls. 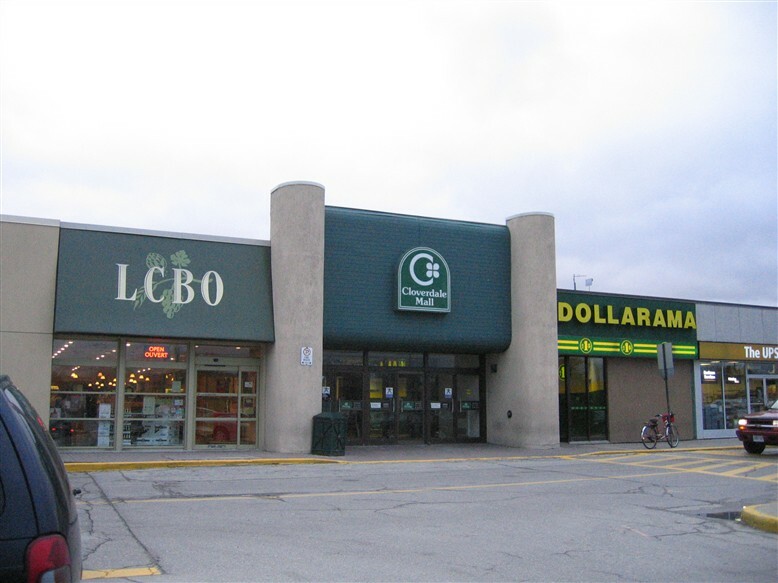 The newcomers fuelling the rapidly growing population of Mississauga kept these places going with all of them going through many changes in concept, appearance and tenants. When it was an outside mall in the early 70’s there was a very large cement elephant for kids to climb and slide down. And the cafetaria in the department store (eatons? the bay?) served excellent jello. I remember getting lost at the Cloverdale mall back in the early 60’s (65 era). It was an outdoor mall then and had a play area for kids in the centre walkway between the two strips of shops. I was supposed to meet my parents at a small shop across from Simpsons at the time. I missed the directions and ended up in the simpsons store waiting at the customer service counter while the store staff tried to locate my parents. I was wondering if anyone knew of any pictures of the mall from the early 60’s..
What I find alarming is how threatened mall owners seem to be by so-called “dated decor”. I sometimes look at old photos of upscale malls when they opened in the 1960s and 1970s, and some of the decor and interior design. What happened? Someone felt it was “dated” and demolished brilliant design that would have looked good today. The point is that renovations need to be sensitive and if the original design was creative and interesting, it should be enhanced, not demolished. 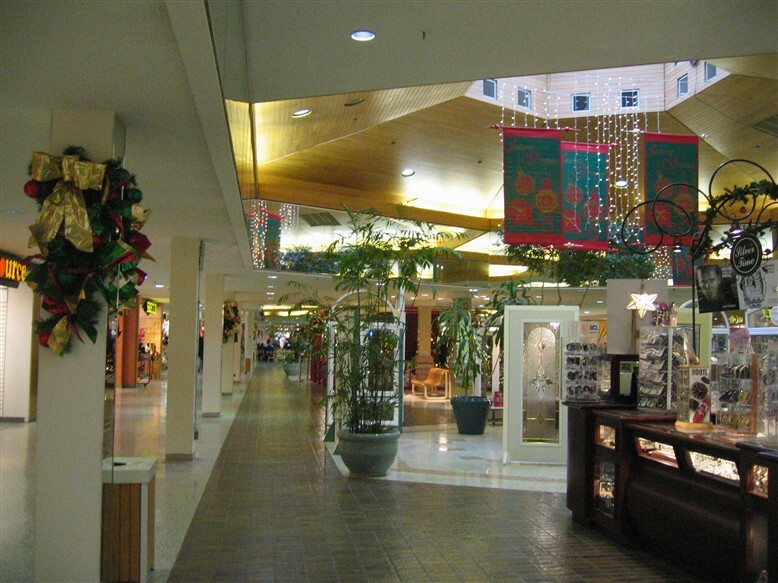 I loved Cloverdale Mall. As a newborn on Harjolyn Drive (just minutes away) my mom used to take me there. First as an outdoor mall…And then I remember the outdoor heaters. I also recall a greek guy who owned a Fries place in the centre of the place. I worked there as a teen at Pet Fair. My mom worked at Playtime and Second Cup. Love that mall miss it! My mum would take us there probably precisely because we could be left in the play area to slide down the concrete elephant. I’ve never been since it was enclosed and suppose that the elephant was not saved from extinction, but would be glad to hear news to the contrary. As one walked from the elephant, at the south end, towards The Bay, at the north, to one’s left was a side alley with, on it’s north side, a bakery called IIRC McDougall’s, which sold sandwiches as well. Back on the central spine, the W H Smith was on the right and did have the wonderful, large curving stairway. Just before The Bay, on the righthand side, was Maynard’s ice cream parlour. See the things that kids remember? Apologies — Cloverdale was the SECOND suburban department store in Toronto. The first was also a Morgan’s, later The Bay, at Lawrence Plaza. In the fall of 2008, Dominion is no more. The chain was bought by an Quebec company, and all Dominion stores were re-branded Metro. i remember the concrete slide well. i never knew it was an elephant! they should make the roof retractable! Along the hallway to the washrooms at Cloverdale Mall there are several photo’s and there are some of what appear to be a parade and there are two of a woman on a go cart in short shorts and would like to know what she was doing at that time and when that picture was taken and for what reason. Was she a model for some thing or in the parade? It is my mother and she has long since passed away but I would like to know about the events surrounding this if anyone knows anything. Thanks for the help. Cloverdale was so much fun as a kid with the wide open spaces and the ‘elephant’ slide/climbing apparatus. I came across this site while searching for old info re Cloverdale – enjoy!